2- Make sure that you deactivated the "beeping" sound of your own car..
3- If a "beeping" car locking device woke you up in the middle of the night, this is unaceptable. You may want to use the following document to put on the windshield of the car so that your neighbors can see it. 2- Pressing the « door lock» button in the door. Please note the licence number, date and time and call police to complain if he wakes you up again. We all like our neighborhood for its peacefullness. This is the reason why the vast majority of us do not use the noisy car locking « beep » that many car dealerships install on new cars to attract attention. By deactivating or not using this system you will not wake up your neighbors at night. During the day it will prevent you from disturbing or waking up neighbors that are sick, retired, on vacation, mentally ill and disabled, babies, night workers that sleep during the day, etc. You will also not startle pedestrians, cyclists and passing motorists. You already deacivated the noisy system? Great. Keep this leaflet for the windshield of the next car that will startle or wake you. If you have received a ticket because your car « beep » exeeds the local noise by-laws (most of them do) we would like to know. We do not think it is fair for you to have to pay a fine. Automobile makers should sell their cars like they do in many other countries by respecting the nightime norm of 40 decibels as suggested by the World Health Organisation. Make sure you do not get fined. If you received this leaflet, someone noticed that your car's beep is probably too loud. See if your car is on our listing with the corresponding decibel rating on our web site. Even if your car is equiped to go much faster, you do drive slowly in a residential area Right? Similarly, if your car is equiped with a remote locking device with a « beep » or a horn, it does not mean that you should use this system in a residential area. The vast majority of us do not use the noisy car locking « beep » that many car dealerships install on new cars to attract attention. By deactivating or not using this system you will not wake up your neighbors at night. During the day it will prevent you from disturbing or waking up neighbors that are sick, retired, on vacation, babies, night workers that sleep during the day, etc. You will also not startle pedestrians, cyclists and passing motorists. You already deactivated the noisy system? Great. Keep this leaflet for the windshield of the next car that will startle or wake you. Congratulation for your nice Honda. I have one myself and I love it. Here is a little advice in case you did not have time to read the Instruction Manual. Our car maker has made our car with an intelligent locking device. We only need to press the locking device button ONCE and it locks the car. We do not need to press the button twice, otherwise it will blow the horn. The intent is that it is to be used only if we do not remember if we locked the car in the first place. By pressing the button twice, we are telling my neighbors that we often forget that we locked the car or they might think we are honking on purpose. Since I would not want my neighbors to think that I forget often or that I am doing it on purpose, kindly press on the button ONCE please. Thank You! Congratulation for your nice Hyundai. I have one myself and I love it. Here is a little advice in case you did not have time to read the Instruction Manual. Our car maker has made our car with an intelligent locking device. We only need to press the locking device button ONCE and it locks the car. We do not need to press the button twice, otherwise it will blow the horn. The intent is that it is to be used only if we do not remember if we locked the car in the first place. By pressing the button twice, we are telling my neighbors that we often forget that we locked the car or they might think we are honking on purpose. Since I would not want my neighbors to think that I forget often or that I am doing it on purpose, kindly press on the button ONCE please. Thank You! Do you really think that this noise is not annoying? Please go to www.hornfree.org and write us your phone number. We will gladly « beep » you at random times during the day and night. 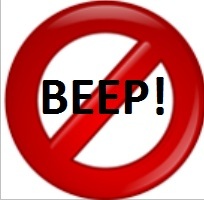 5- You may want to use a "no beep" sign (such as the one below) or make a sign such as "Silence please - No beeps" or something similar and put it on your lawn, window or balcony. If you convince your neighbors to do the same it would be much better. Please send us a picture to share with others.